Lucky film fans in Manchester have the chance to see what we believe is possibly one of the greatest science fiction films ever made when the Jameson Cult Film Club bring a restored and remastered version of James Cameron’s The Terminator back to the big screen for one night only this October 4. I love The Terminator and I’m quiet jealous that I won’t be up in Manchester to see this restored version of The Terminator screened in public for the first time in the UK. I managed to catch the Jameson Cult Film Club screening of the restored Blu-ray version of Jaws earlier this month and it was marvelous to see (arguably) Steven Spielberg’s greatest film back on the big screen in high definition as it was intended to be seen. I will have a full write up of the Jameson Cult Film Club Jaws experience up as soon as I find the time, but there is always something getting in the way. It has to be said that the Jaws screening was the best Jameson Cult Film Club screening I have been to yet, so they are getting better and early indications are that The Terminator screening is going to be epic! A couple of year ago I got to meet James Cameron and attended a talk given by him about his career and his films including; Titanic, Avatar and as it is one of my favourite sci-fi films of all time The Terminator. I have been a fan of James Cameron since about 1985 when my mind was melted by The Terminator. At the time The Terminator was like nothing we had seen before – fresh, original and a budget that kept it edgy and borderline Grind-house. 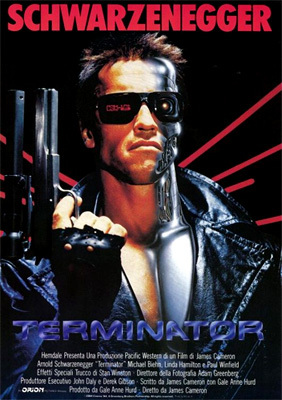 In a single narrative stream James Cameron’s Terminator mashed together science fiction memes, tapped into man’s fear of technology, bent genres, presented ingenious raw visual effects and merged complex plot elements into a thrilling rollercoaster ride. I still rate The Terminator as one of my favourite films of all time. It’s one of those films that are so fresh it pulls the carpet out from everything that has gone before. Off course I am in no way ignoring Harlan Ellison’s original Outer Limits stories Soldier and Demon with a glass hand which seem to serve as seeds for Cameron’s vision. I had seen and enjoyed some of his previous works (at the time had little to no idea that he was involved) such as Roger Corman’s 1980 Battle Beyond the Stars, John Carpenter's outstanding 1981 Escape from New York, his directorial debut Piranha II: The Spawning, Galaxy of Terror and Android in 1982. Since then, Cameron has gone on to conquer the world and I have enjoyed most of his recent works to varying degrees, but The Terminator will always epitomize James Cameron and science fiction for me. It is clearly the work of a man consumed by his passion, overcoming a small(ish) budget with a lot of talent - as can be evidenced by the mighty legacy that The Terminator has spawned including; the creation of a genre, a cultural icon, a sci-fi phenomenon, groundbreaking special effects, a merchandising empire, a cult following, a successful line of sequels, one of the most memorable quotes in cinema and rock solid careers for James Cameron and his team. All this from a screenplay he sold for $1 with the condition that he could direct it. Over the years much has been made of his love of technology and technical detail, but above all that he is a master storyteller that creates credible environments to enable his vision. Love or just tolerate James Cameron’s films, I think it can be agreed that the world he creates on screen to support his tales are believable and immersive. This is the work of a brilliant film all-rounder who loves what he does. I had heard various versions of how The Terminator came about and was keen to hear in Cameron’s words how The Terminator was conceived. He sketched it and around this nucleus he created a story that included what it was, where it came from and who it was after. It all fell into place. From this idea, when he got back to LA and was sleeping on a friend’s coach he talked an agent into representing him. So he went to pick a fight with the relatively unknown Conan instead. Arnold Schwarzenegger was charming, passionate and loved the script. He was liked for the Kyle Reese part but the whole time Cameron was talking to him he was thinking he was perfect for The Terminator. The Terminator is out to own on Blu-ray from 1st October 2012. On Thursday 4th October, Jameson Cult Film Club will be holding their most epic event yet with a spectacular screening of James Cameron’s unforgettable film, The Terminator. Jameson will be taking over the Victoria Warehouse for a unique 80s-inspired film screening, re-enacting the famous nightclub scene from the film and hosting an 80s techno rave for Manchester film fans to enjoy. As guests reach the warehouse they will make their way down a backstreet alleyway lit by a Broadway street sign, past a homeless man by a fire pit and two cops searching for a strange man last seen naked running in the direction of the club. Once inside, guests can join Sarah Connor for a Jameson cocktail at the bar or flag down a waitress for a Burley Beef burger from Big Jeff’s burger bar surrounded by flashing lights, red neon, smoke and 80s music. As guests explore the club they will find the LAPD Homicide Unit’s office where the Lieutenant and his colleague Ed are examining pictures of the various Sarah Connors who have been executed that morning. In the other corner, blue flashing lights and smoke blow around the stage as Sarah Connor sits nervously at the bar, eyeing the door as a strange figure dressed in a leather jacket and dark shades stalks around the club scanning for his victim. After the film, guests can party to classic 80s techno tunes from a famous Manchester DJ until the early hours. Doesn’t worry if you miss the event this time as the Jameson Cult Film Club WILL BE BACK! (in 2013) in the meantime get ready for Bram Stoker’s Dracula which Jameson Cult Film Club will screen for Halloween in Newcastle (the home of New Slains Castle which is said to have been Bram Stoker's inspiration for the castle of Count Dracula). For more information and tickets head over facebook.com/jamesoncultfilmclub for the latest updates.